79 Marlborough is located on the north side of Marlborough, between Berkeley and Clarendon, with 77 Marlborough to the east and 81 Marlborough to the west. 79 Marlborough was built ca. 1864 for shipping merchant and real estate investor John Lowell Gardner, one of nine contiguous houses (71-73-75-77-79-81-83-85-87 Marlborough) he had built as rental property. He and his wife, Catharine Elizabeth (Peabody) Gardner, lived at 7 Beacon and then at 182 Beacon. Click here for an index to the deeds for 79 Marlborough. By June of 1864 (when their daughter, Charlotte, was born), 79 Marlborough was the home of Isaac Martin Cate and his wife Charlotte (Abbott) Cate. They previously had lived at 586 Tremont. He was a wholesale metals merchant and dealer in boilers and flues. 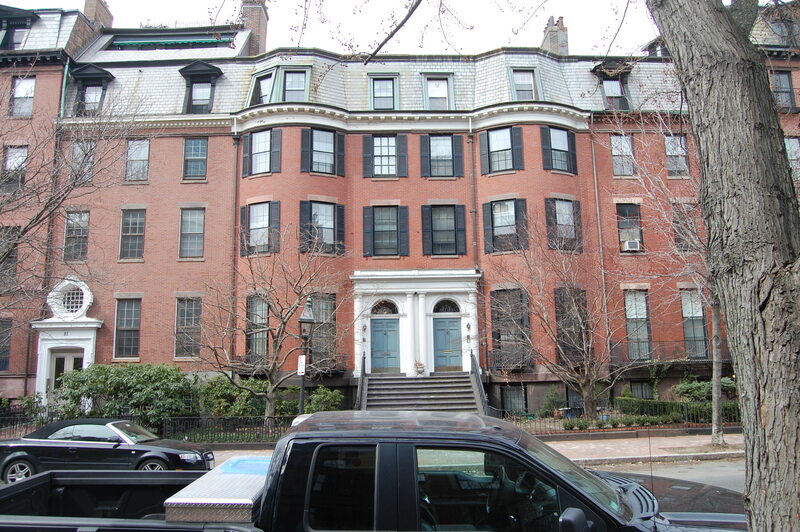 They continued to live at 79 Marlborough in 1868, but had moved to Brookline by 1869. By 1870, 79 Marlborough was the home of Richard Henry Dana, Jr. and his wife, Sarah (Watson) Dana. They had lived in Cambridge in 1869. Richard Henry Dana was an attorney and author. In 1840, he published Two Years Before the Mast, an account of his voyage as a seaman, sailing around the Horn to California. He also authored numerous other books and articles. As an attorney, he was prominent in the legal defense of people involved in the protection of fugitive slaves. He served as US Attorney for Massachusetts from 1861 to 1866, and in 1867-1868 served with William M. Evarts as counsel for the United States in the proceedings against Jefferson Davis for treason. By 1872, the Danas had moved to his father’s home at 43 Chestnut, and by 1874 to 361 Beacon. By 1873, 79 Marlborough was the home of Sebastian Benson (born Samson Sebastian) Schlesinger and his wife, Berthe (de Pourtales) Schlesinger. They had lived at 218 Tremont in 1872. Sebastian Schlesinger was an iron merchant and manufacturer of nails, in partnership with his brother, Barthold Schlesinger. He also was a noted composer, principally writing “art” songs, setting well-known poems to music. He served as German Consul in Boston for seventeen years. Berthe Schlesinger’s father, Louis François de Pourtales, a noted naturalist and marine zoologist, lived at 79 Marlborough with the Schlesingers until his death in July of 1880. The Schlesingers continued to live at 79 Marlborough in 1882. By 1883, they were living in Beverly Farms. By the 1882-1883 winter season, 79 Marlborough was the home of Eliza Roberts (Nye) Leighton Fitz, the widow of George Leighton and of Albert Fitz, and her daughter, Eliza (Lizzie) Roberts Fitz. 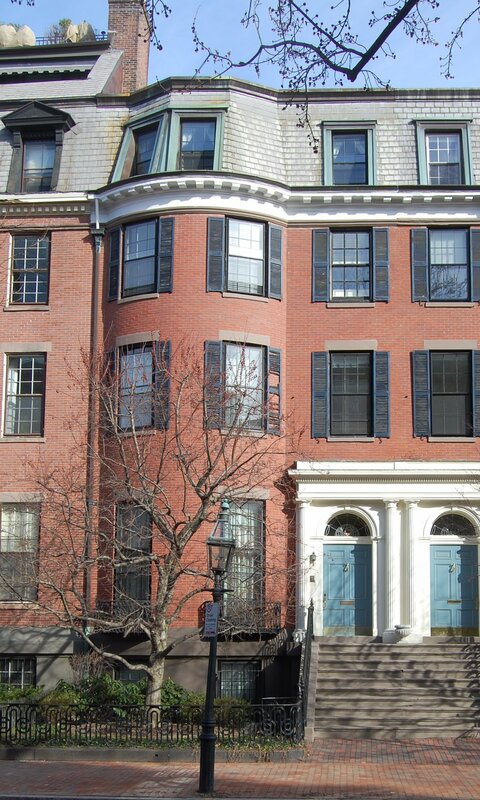 Mrs. Fitz (and probably Miss Fitz) previously had lived at 108 Boylston. Albert Fitz had been a private secretary to Daniel Webster and served as a mercantile agent for the United States for various ports in the West Indies. He died in July of 1852. After his death, Eliza Fitz founded and directed the Brookline Seminary for young ladies. 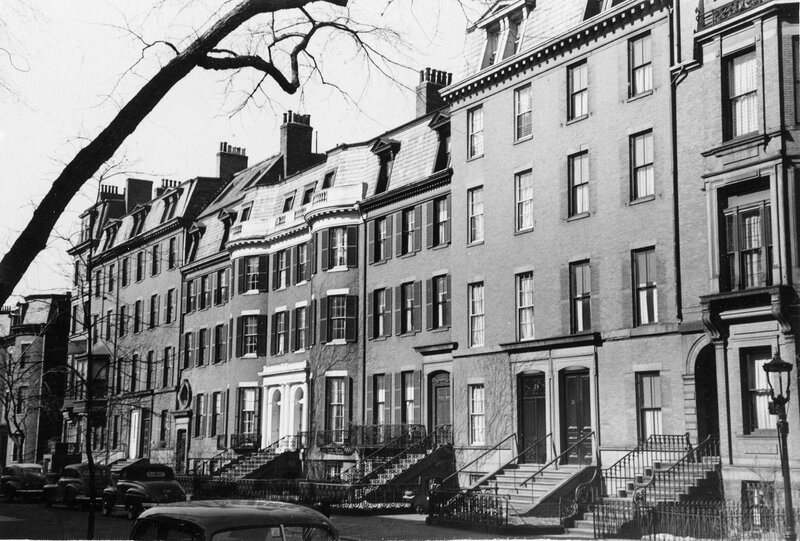 Eliza Fitz’s nephew, Luther Little, an iron and steel merchant, lived with her at 79 Marlborough, and previously had lived with her at 108 Boylston. He was the son of Solomon Little and Rebecca A. (Nye) Little. Lizzie Fitz continued to live at 79 Marlborough in 1895, but had moved to the Hotel Tuileries at 270 Commonwealth by 1897 and married in July of 1897 to William Wisner Doherty, an attorney. 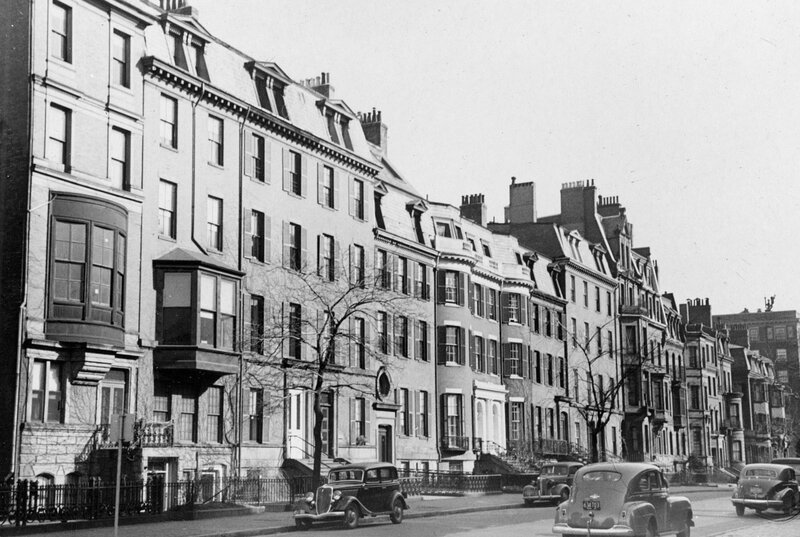 Mrs. Fitz and Luther Little continued to live at 79 Marlborough until her death in February of 1898. After her death, he moved to 93 Mt. Vernon. 79 Marlborough was not listed in the 1899 Blue Book. By the 1899-1900 winter season, it was the home of stockbroker Samuel Shober Gray and his wife, Caroline Balch (Weld) Gray. They previously had lived at 5 Gloucester. They continued to live at 79 Marlborough in 1907, but had moved to the Hotel Vendôme by 1908. On April 1, 1907, 79 Marlborough was purchased from the trustees under John L. Gardner’s will by John Phillips Reynolds, Jr. He and his wife, Lucretia Revere (Munroe) Reynolds, made it their home. They previously had lived at 279 Marlborough. John Reynolds had been associated with the Walter M. Lowney Company, manufacturers of chocolate products, and subsequently was treasurer and director of various companies. 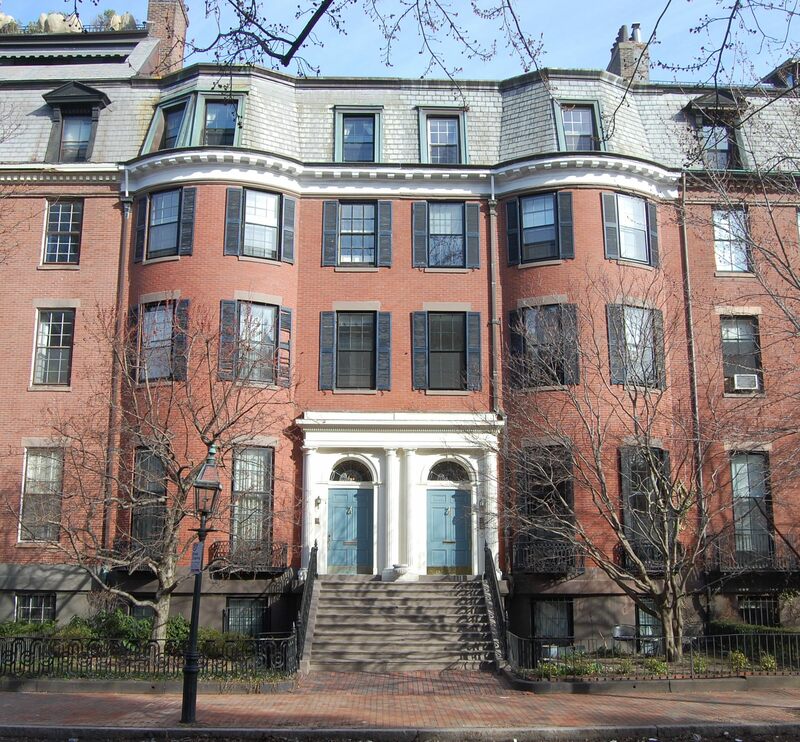 In 1902, he purchased the former home of his great-grandfather, Paul Revere, at 19-21 North Square, and led the effort to have it preserved as an historical site. In 1907, he transferred it to the Paul Revere Memorial Association. The Reynolds’s two children – Priscilla Munroe Reynolds and John Phillips Reynolds, III — lived with them. Priscilla Reynolds married in January of 1920 to George Lindsley Burr; after their marriage, they lived in Dobbs Ferry, New York. John Reynolds died in December of 1920. 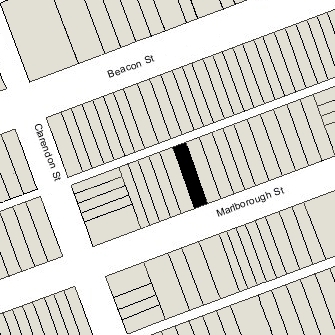 Lucretia Reynolds and their son continued to live at 79 Marlborough in 1921, but moved soon thereafter. On July 8, 1922, 79 Marlborough was acquired from Lucretia Reynolds and Bessie Hanington by Paul Barron Watson. He and his wife, Katharine (Clarke) Watson, made it their home. They previously had lived at the Hotel Somerset and, before that, briefly at 278 Clarendon, which they had significantly remodeled. They also maintained a home in Milton. Paul Watson was an attorney and author of several books on history. He also served as Secretary and treasurer of Wentworth Institute of Technology from its founding. Katharine Watson died in September of 1937. Paul Watson continued to live at 79 Marlborough until his death in March of 1948. On August 2, 1948, 79 Marlborough was purchased from Paul Watson’s estate by attorney Henry Lowell Mason, Jr. and his wife, Fanny Crowninshield (Homans) Warren Mason. Henry Mason’s father, Henry Lowell Mason, lived with them. A widower, he was the retired president of the Mason and Hamlin Piano Company (founded by his father) and the American Piano Company. He also was an author of historical works about the piano and organ. They all previously had lived at 289 Marlborough. Henry Lowell Mason, Sr., died in October of 1957. Henry and Fanny Mason continued to live at 79 Marlborough until about 1958. On September 5, 1958, 79 Marlborough was purchased from Henry Mason, Jr., by William Julian Porter and his wife, Beatrice Virginia (Bradbury) Porter. They lived at 84 Commonwealth and then at 119 Beacon. 79 Marlborough was shown as vacant in the 1959 City Directory. The Porters converted 79 Marlborough into a multiple dwelling, either a lodging house or apartments. By 1960, they had moved to one of the units. On April 29, 1961, 79 Marlborough was purchased from the Porters by Richard A. Anthony and his wife, Rosalie L. Anthony. The property changed hands and on January 12, 1973, was acquired by Michael W. Marcus and his wife, Elizabeth R. Marcus. In February of 1977, they filed for (and subsequently received) permission to legalize the occupancy as a five apartments, indicating that the building had been used for that purpose for “many years” with an accessory use of a medical office. On September 1, 1983, 79 Marlborough was acquired from the Marcuses by Robert F. Oberkoetter, trustee of the Sanjika Realty Trust. On August 29, 1995, 79 Marlborough was acquired from Robert Oberkoetter by Enrico Dolazza and his wife, Virginia Dolazza. 79 Marlborough remained an apartment building, assessed as a four- to six-family dwelling, in 2015.